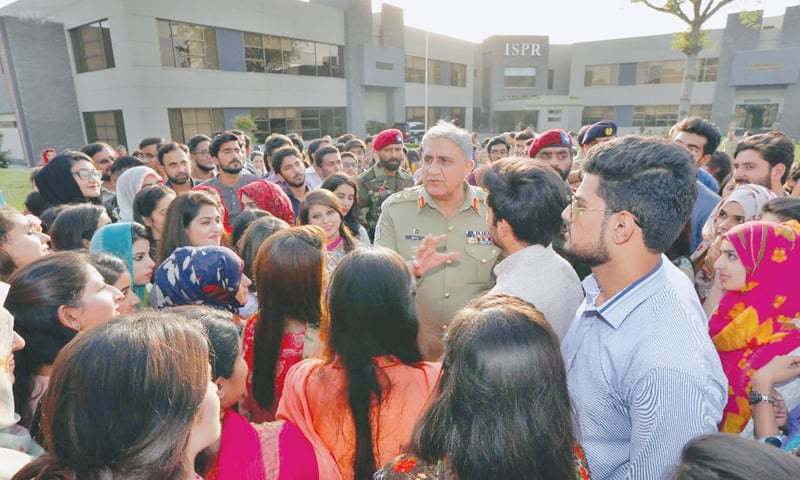 Chief of the Army Staff (COAS) General Qamar Javed Bajwa, while speaking to the students on the eve of internship completion at ISPR, has urged the young generation to avoid spreading hostile ideas on social media. Bajwa warned the Pakistani youth to be wary of the extremist organisations like the Islamic State group saying that they are their prime targets. He visited the Directorate on Thursday and congratulated the students on completing their internship from July 11 to Aug 17. The COAS said that youth is the future of Pakistan and that this generation has the talent and ability to steer Pakistan towards an era of progress and peace. The Army Chief persuaded the students to follow the rules, avoid shortcuts, stick to the merit, trust their abilities, and advised them to realise their full potential for the greater good of Pakistan. Talking about his motivation to boost the morale, he said that his uniform and the confidence in youth has kept him going during the tough times. He assured the young generation that Pakistan Army was trying its best to make Pakistan peaceful and that they will make it secure and stable for everyone. Every Pakistani is a soldier of Raddul Fasaad operation. Your success and progress in life depends on three things: faith in Allah, serve your parents and hard work. This trinity is key to success. I am A Soldier of Raddul Fasaad ! Was it worth to post it? Like every Pakistani male even the General is a little tharki . In a crowd of of mix gender students, he is instinctively addressing the girls only and has ignored the presence of boys. Typical scenario when a high power official, politician or a corporate visits a university. I can assure you that when a Pakistani guest of honor addresses a young crowd their attention is 80% towards the girls. There is no harm in acknowledging a reality. Why are you getting uncomfortable? Who is really tharki is the one who thinks the other one is tharki. Ok. Lets put aside the accusation of being tharki. Tell me what is the explanation for when any male official informally addresses a young crowd, he is much more eager to interact with and focus on the females; while prefers to maintain a distance with males? You need to go do something better with your life man. He’s speaking to the crowd as a whole. He doesn’t has any life dear. Poora din ghar mein baith kar banda kia life jiye ga.
Dude don’t take him seriously, he is an idiot. Everyone is laughing at him, bloody laughing stock. General Bajwa is ke samne ayege to is ke pant se liquid leak hoga LOL! little kid on web ……………….kahi tum qadyani tu nahi……………..
Don’t take him seriously, he is an idiot. Ghar mein ziada rahne se yahi hota hai bande ka demaag karab hojata hai. ha Liberal ka ghar ma rehnay ki waja sa aisa hota deemaag kharaib ho gaya ha mera Qadyani bachay………………..
Well if every “Pakistani” is tharki then what r u? Oh so u r so jealous that u have no girlfriend. Well which girl gonna give u attention when u r a tharki. Please don’t embarrass urself and take a hike. There is no harm in acknowledging “the” reality that u r a loser and girls don’t give attention to losers like urself.